A recent column in the U.S.A Today makes the bold claim that there are less startups today than compared to the 1980’s, during the Carter administration. At any rate, the latest data indicate that start-ups are becoming rarer, not more common. A new report from JPMorgan economist Mike Feroli indicates that employment in start-ups is plunging. 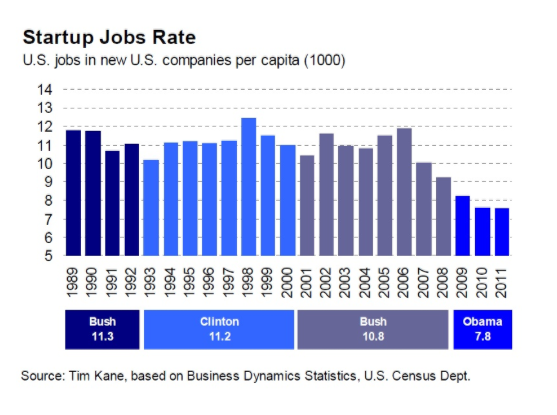 New jobs in the economy tend to come from new businesses, but we’re getting fewer new businesses. I am going to guess Glenn Harlan Reynolds, a professor and the author of the post, is not an entrepreneur and has never been one. If he was one he would know basing innovation metrics and the quantity of “startups” solely on the amount of people they employ is an incredibly flawed argument. Hudson’s possible suspects for the slowdown: a) higher business taxes, b) Obamacare, c) an IRS crackdown on US employers that hire U.S. workers as independent contractors rather than employees, and d) a steady barrier erected to entrepreneurs at the local policy level. But whatever the cause of the entrepreneurial decline, two possible impacts: 1) A less productive and innovative economy, and 2) higher profits for big business thanks to fewer upstart competitors on the horizon. 1) Assuming Obamacare is a factor completely misses the point, since Obama wasn’t even in office when the decline in jobs started (see chart above). 2) Although a local policy issue may influence certain industries – since we’re talking the entire nation here it’s irrelevant to include local policies because they vary state to state. I, for one, can tell you it’s quite easy to get going in your own new venture. 3) The IPO market really cooled off over the last decade, suggesting a rise in mergers and acquisitions. Simply stated, startups are being bought by bigger companies before they beef up their workforce, which also will affect overall startup employment numbers. 4) If anything, they miss the most obvious reason why people would choose employment at a larger corporation rather than a startup: job security and dependable paycheck in a shaky economy. Although this also doesn’t apply since the economy didn’t tank until late 2008 and beyond, so again, not a very high correlation. 5) The largest omission in this report can be seen by evaluating technological progress and the resulting drop in computing costs. Comparing the chart from the JP Morgan article and a graph of Moore’s Law (which is exponential) you now realize using a simple number like the number of employees of startups is probably the wrong approach when determining the current status of innovation. 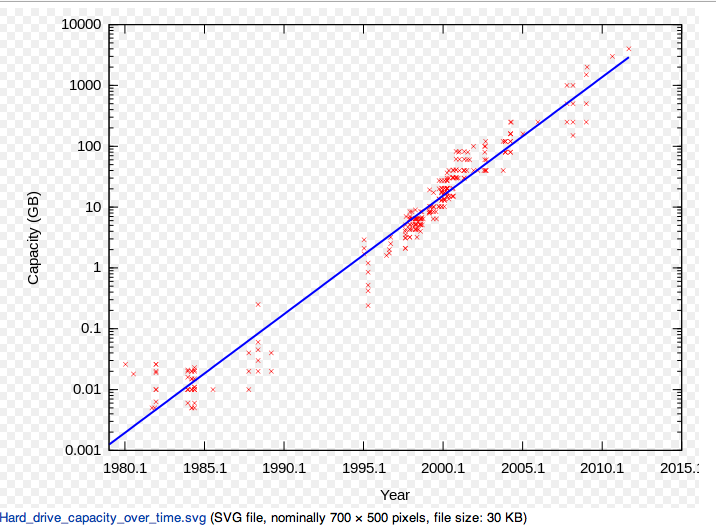 Moore’s Law states the computing power is increasing at the same time the cost is dropping. So, it is easier to start a business than ever before. The cost of computing, virtual work environments, AWS, instant and free communication tools, and the proliferation of the web have coalesced to create a startup nirvana. Looking at two charts from the same timeframe you will notice the stark drop in jobs at the same time a drastic increase in computing power? Coincidence? I don’t think so. Maybe if they simply stated “startups are employing less people” I wouldn’t have a problem with the report. But they didn’t. They claim (in fact lead with) the idea that there are less startups and innovation than in the 80’s and 90’s, which I feel is wrong – or at least how they came to that conclusion is currently flawed. They go on to make a few solid points regarding higher taxes and government regulation and how those influence an early venture hiring but lack any real depth for their argument. Maybe they should have consulted an entrepreneur or two who could help them sift through the chaff a bit further. My take: it takes less people to achieve more today. What once took a team of 10 to accomplish now only takes 2 or 3 people and a wifi connection. So I am claiming the exact opposite of the USA Today and JP Morgan. We are seeing more products, apps, and startups created today than ever before. Ask any VC or startup founder and I guarantee they will say the same thing. Hell, Instagram and their entire team of 12 employees was sold for almost $1 billion to Facebook in 2012. So whatever you do, do not believe there is a lack of innovation and startups out there. If anything, there’s more innovation and startups created each day than ever before because we can do more with less. One just needs to look closer and use the right measuring stick. One of the most common challenges for early stage startups is finding talented and willing people to join your startup. In the early stages, finding the right developer can be the difference between success and failure for a young startup. Today, SURF Incubator announced how they are addressing the recruiting challenges of its tenant companies by partnering with local recruiting agency Capability IT. With an intellectual partner like Capability IT, startup entrepreneurs are empowered with intellectual resources and a robust network to find culturally and technically capable employees, enabling them to more quickly secure talent and get back to work. Although the Puget Sound region has proved itself to be home to a world-class high-tech workforce over the last few years, with several companies either opening Seattle engineering offices or expanding their engineering departments, it still remains a tough hiring environment for early stage startups. Especially since the competition can promise an immediately rewarding salary with large signing bonuses, full benefits and various amenities like a famous executive chef at Google. But through a partnership with Capability IT, SURF startups will receive greater access to a network of developers and potential growth opportunities, making their lives a bit more pleasant in the process. Over the past year, Capability IT has made solid traction in the tech community, by adding superior talent to a number of Seattle based startups. Not only does Capability IT provide more access to developers, they can also help startup entrepreneurs identify and secure contract assignments. It is quite common for entrepreneurs to take on technical consulting projects while their startup gains traction, enabling entrepreneurs better cash flow and sometimes even finance their startup. Because Capability IT works with companies ranging from early-stage startups to publicly traded companies, they are able to efficiently source opportunities for fledging entrepreneurs. Being a SURF tenant startup founder myself, I can validate how important this move is for all the startups within the SURF Incubator community. During the early prefunding stage of a startup, founders have little more than their dream to pitch to prospective early talent. We also have limited time and energy to somehow go and find this talent., which requires scouring online profile databases, attending local meetups and events, searching through our own networks or simply asking around. At times those can work, but where I see Capability IT really helping is farther up the funnel, providing founders with a larger pool of applicants/names to sort through. Even though we might still be looking for a needle in a haystack, Capability IT will give early stage startups more haystacks to look through and in the end helping us find better talent to join our teams. In this way, Capability IT’s partnership with SURF Incubator is just one part of SURF’s mission to be a community-supported space for digital startups. SURF will be celebrating this announcement with a happy hour event, including beer and wine as well as a few startup pitches from resident companies. Everyone is welcome to attend, if you are interested – RSVP here. This is truly an amazing time. 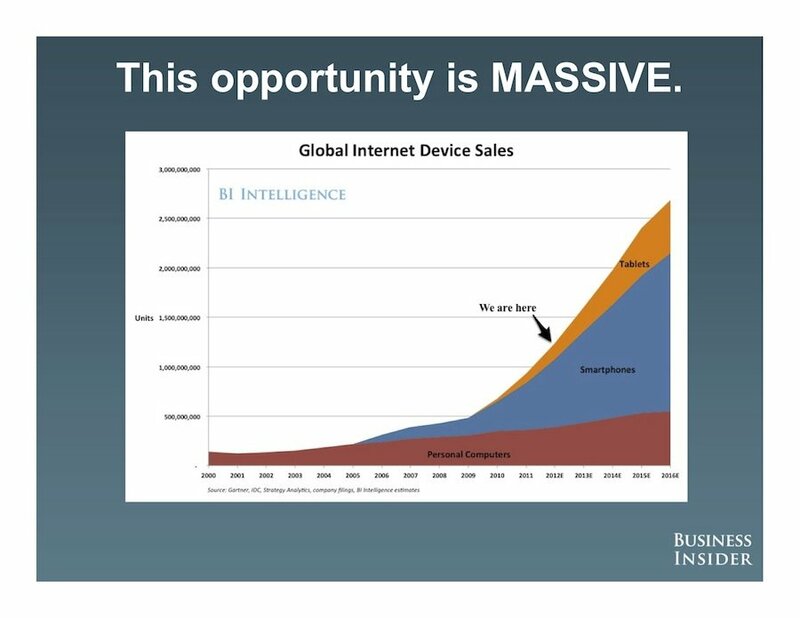 This one slide from a recent Business Insider presentation is the main reason why I started Seconds. We are seeing a revolution around mobile devices and every industry will experience immense changes, whether they like it or not. Payments are no exception and it’s going to be a wild ride baby! So much more happened over the course of the last year but I will stop there. I want to make something very clear: your life is what you make of it. I have completely transformed my life in the last 365 days and I sit here today in awe of what I have been able to do. We are (close) to being finalists in national recognition for being one of the top innovative companies of 2012. I could’t have dreamed of this just one short year ago. This transition has not been easy – actually the most difficult thing I have ever done in my life – but it’s not impossible. You can do anything you set your mind to, never forget that.